Tadao Ando and Yayoi Kusama, both of them are known all over the world, can be appreciated on Naoshima at the same time. Naoshima is world-widely known as a small island where art and nature melt into each other. Many modern artworks are found everywhere on this beautiful nature-rich island, so everybody can enjoy them in a leisurely manner finding themselves with plenty of time. Quite a few non-Japanese visitors are here, in spite of the long distance from major cities of Japan with no good transportation. 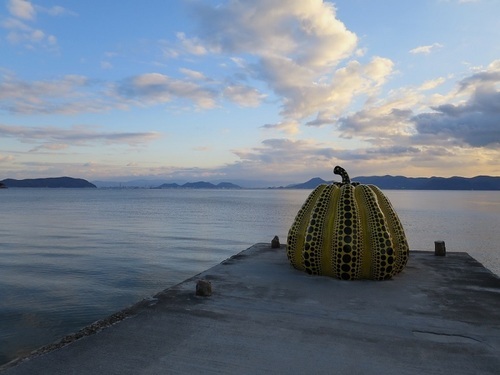 The first picture shows a statue of ‘Kabocha’ pumpkin created by Yayoi Kusama, which can be mentioned at the head of the popular artworks on this island. This statue stands near the Benesse House, the central facility on this island, and is uniquely polka-dotted which is the characteristic of this artist. 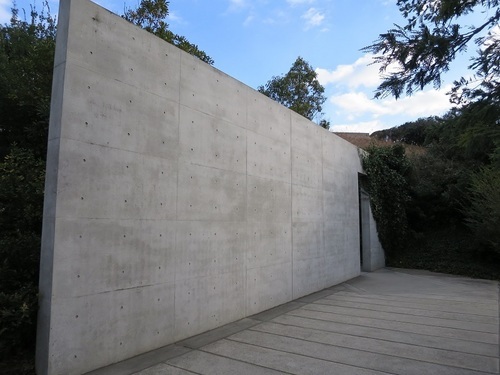 The second picture shows the entrance of ‘Chichu Art Museum’ designed by Tadao Ando. This museum is built in the ground and features several paintings of ‘Water Lilies’ by Claude Monet as well as the architecture itself.